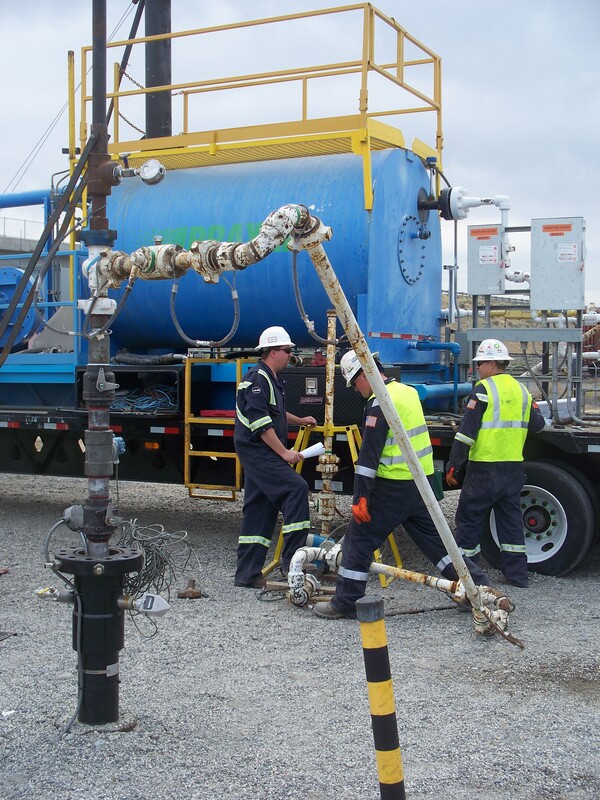 Technicians align a downhole packer and pressure/temperature monitoring system into the CO2 injection well. Photo courtesy of Energy Solutions Inc.
Praxair technicians make adjustments to the CO2 piping. The injection well itself is in the foreground, left. Photo courtesy of Boise Inc.
WALLULA, Wash. — An injection of carbon dioxide, or CO2, has begun at a site in southeastern Washington to test deep geologic storage. Battelle researchers based at Pacific Northwest National Laboratory are injecting 1,000 tons of CO2 one-half mile underground to see if the greenhouse gas can be stored safely and permanently in ancient basalt flows. Boise Inc. teamed with Battelle, which operates PNNL for the U.S. Department of Energy, and Praxair, Inc. to conduct the CO2 injection phase of the pilot project. Injection is occurring on Boise property in deep basalt — the same massive ancient lava flows that underlie major portions of Washington, Oregon and Idaho. The joint research is conducted under the Big Sky Carbon Sequestration Partnership, which is led by Montana State University and funded by DOE and a consortium of industrial partners. It is one of seven regional partnerships throughout the United States aimed at finding safe and economical ways to permanently store the nation's greenhouse gas emissions. "We have been conducting laboratory tests on basalts from the region for several years that have conclusively demonstrated the unique geochemical nature of basalts to quickly react with CO2 and form carbonate minerals or solid rock, the safest and most permanent form for storage in the subsurface," said Battelle project manager Pete McGrail. "However convincing the laboratory data may be, proving the same processes operate deep underground can only be done by conducting a successful field demonstration. We have taken the very first steps to do that here in Wallula." 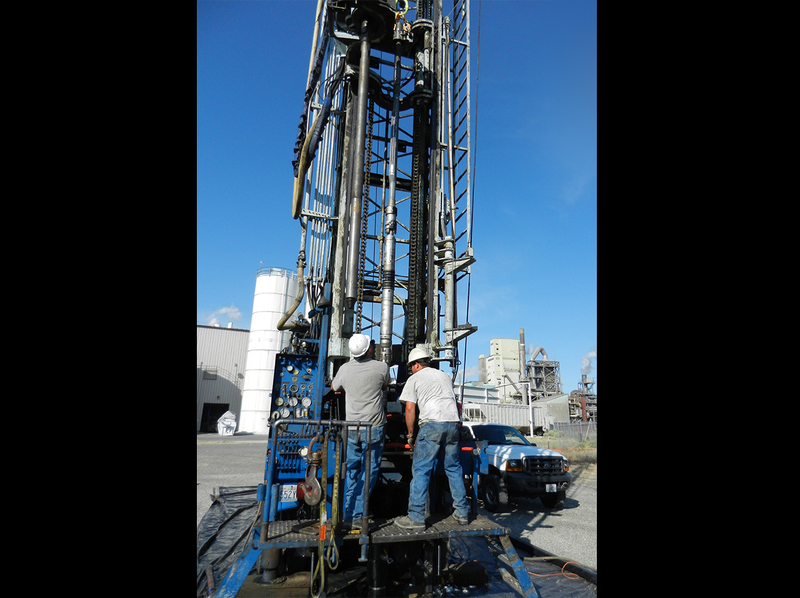 Over the next 14 months, fluid samples will be extracted from the injection well. Scientists will look for changes in chemical composition in comparison to baseline data compiled prior to injection. Scientists will also compare results to predictions made using PNNL's supercomputer. At the end of the monitoring period, rock samples will be taken from the well. They are expected to exhibit the formation of limestone crystals as a result of CO2 reacting with minerals in the basalt. The Boise pulp and paper mill, located in the Columbia Basin between the Tri-Cities and Walla Walla, Wash., sits atop dozens of volcanic lava flows, extending down 8,000 feet or more. Like a stack of pancakes, these geologic layers were formed as volcanic lava flowed and cooled, one on top of the other. In 2009, an injection well was drilled at the site confirming that basalt flows located immediately above and below the injection zone were nearly impermeable. Additional research conducted at the site in late 2012 indicated that the location is well suited for the pilot test. "Boise is pleased to have worked with Battelle in recent years and to be a partner for this research that advances the science of geologic carbon sequestration," said Rich Garber, Boise environmental director. "At Boise Inc. we believe wisely using energy and resources is good for business and for our environment. Through various other means, we've reduced our greenhouse gas emissions 27 percent since 2004 at our manufacturing facilities. This collaborative effort with Battelle is an additional opportunity for us to build on that progress and demonstrate our commitment toward continuous environmental improvement." According to recent DOE estimates, the United States and portions of Canada have enough potential capacity in geologic formations to store as much as 900 years of CO2 emissions. If the Wallula demonstration is successful, basalt flows in many parts of the world may serve as storage locations to store CO2 emissions from a variety of industrial facilities. "Boise has been a fantastic partner and there is no question that this field research could not have been done without their unwavering support," said McGrail. The demonstration is approximately 80 percent funded through DOE's National Energy Technology Laboratory. To date, approximately, $12 million has been committed to the pilot project. Other contributors include Schlumberger, Royal Dutch Shell, Boise Inc., and Portland General Electric. Click here for more information on PNNL's carbon storage research, field projects and capabilities. Headquartered in Boise, Idaho, Boise Inc. manufactures a wide variety of packaging and paper products. Boise's range of packaging products includes linerboard and corrugating medium, corrugated containers and sheets, and protective packaging products. Boise's paper products include imaging papers for the office and home, printing and converting papers, and papers used in packaging, such as label and release papers. Our employees are committed to delivering excellent value while managing our businesses to sustain environmental resources for future generations. Boise Inc. has set voluntary goals to reduce greenhouse gas emissions, water use and energy use and uses the ISO 14001 international standard to establish targets for continuous improvement of environmental performance at its paper mills. Led by Montana State University, the Big Sky Carbon Sequestration Partnership (BSCSP) is one of seven partnerships involved in the US Department of Energy's Regional Carbon Sequestration Partnership program. The BSCSP relies on existing technologies from the fields of engineering, geology, chemistry, biology, geographic information systems and economics to develop novel approaches for both geologic and terrestrial carbon storage in our region. The BSCSP region encompasses Montana, Wyoming, Idaho, South Dakota, eastern Washington and Oregon. Praxair, Inc. is the largest industrial gases company in North and South America, and one of the largest worldwide, with 2012 sales of $11 billion. The company produces, sells and distributes atmospheric, process and specialty gases, and high-performance surface coatings. Praxair products, services and technologies are making our planet more productive by bringing efficiency and environmental benefits to a wide variety of industries, including aerospace, chemicals, food and beverage, electronics, energy, healthcare, manufacturing, metals and others.